Llamatron is one of my all time favourite shoot em ups and I was looking forward to playing this as it was programmed by Jeff Minter. Unfortunately this game just isn't in the same league as llamatron. Does that mean it is isnt worth playing? Well thats a hard question to answer and will probably depend if you have fond memories of this game from the Commodore 64. So what is good about the game? The game has the usual quirkyness of a Jeff Minter game. 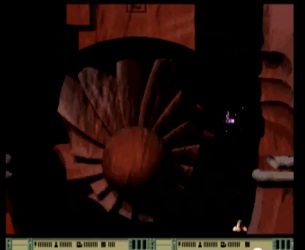 There are the strange computer animal sound effects and the main character is a camal rather than the standard spaceships that you normally get in shoot em ups. There is the very 80s flashing screen effects and psychodelic colours of the early arcade games. There are three ways to play the game. Firstly there is solo mode where you control only the camal as you take on the twenty levels of oncoming badies. Secondly there is computer assisted mode which makes things easier as the computer controls a goat and shoots some of the badies for you. Lastly there is two player mode where one of you control the camal and the second player controls the goat. There are the usual power ups which become available as you shoot the badies. These provide the usual assortment of bonuses such as extra lives , bombs or extra power. To add some variation to the game there are obsticles which block your path along the foot of the screen. These can either be destroyed by being fired at or jumped over. Overall this game has the features you expect from a Jeff Minter game but just doesn't live up to the high standards of Llamatron. But then that was always going to be a hard game to follow. The game can be downloaded from the link below. The game was also provided as a cover disk on Amiga Format Issue 34 - May 1992. The Shoot Em Construction Kit was guilty of allowing many dull shoot em ups being created on the Amiga. Some of these were bad due to awful graphics, unimaginative sound effects and poor enemy attack patterns, or in the majority of cases due to all three. The Raid series of SEUCK games provides a plesant surprise. The creator of these games spent some serious time in creating these games. The graphics are of a very high standard and this applies to both the background tiles as well as the main game sprites. The creators attention to detail didn't stop just there as time was also spent on the sound effects with either careful research to locate suitable sound effects to include or time spent creating the sound effects from scratch. Finally the attack patterns are difficult but not impossible to navigate. All this contributes to a very polished game. The biggest frustration of this game is due to the limitations of SEUCK. The package prevented any powerups from being made available. The sprite collusion is not pixel perfect. There are no large end of level badies and if they were then they would be made up of joined sprites which never really work. Overall this game isn't going to blow you away but will definately provide a few minutes of fun blasting. If you a fan of the SWIV games you may enjoy the way the series pays tribute to that game. The game and its sequels can be downloaded from the link below. This game is basically a two player death match set in space. The controls for the space ships are similar to those used in thrust with gravity included in the game world to pull your ship back towards the ground. The graphics however are a million miles away from the basic line graphics of the 8 bit game. This game started of as shareware but the author has now kindly made the game available as freeware and can be downloaded from Aminet. The full version of the game contains 6 worlds of raytraced backgrounds, active background elements such as cannons, teleporters and forcefields and most importantly lots of different weapon upgrades. The game has lots of options to keep you interested. There are different worlds to fight in. Each world is beautfiully created and look stunning. There are different ships to choose and these can be equiped with different weapons and shields. Each ship can be armed with two weapons. These are fired by either pulling backwards or forwards on your joystick. There is a one player game but this may become a bit repetitive as the best fun is mocking your opponent as you blast them to kingdom come. Whilst you coud still shout cutting put downs to your Amiga it just doesn't respond in the same joystick throwing storming out of the room in a mood way as a human opponent. If it does, well then hats off to the modifications you have added to your machine since the 90s. A playable demo of this game can be downloaded from our download from the link below. A full version of the game can be downloaded from the Aminet website.